Portillo’s is a national restaurant chain which operates 41 locations across the country. Despite getting its start in the Chicagoland area in 1963, for many years, there was only one location in the city. The announcement of a second restaurant, in the South Loop, was big news for fans of the chain. The new location has two floors, rooftop and ground floor patios, and seats approximately 240 people. Burnham leveraged its expertise in permitting and code compliance to support Portillo’s vision for the building design and customer flow through the restaurant. The restaurant design incorporates Portillo’s mission to provide “fresh food in a fun and friendly environment.” With Burnham’s experienced help throughout the permitting process, Portillo’s was able to meet its aggressive date for the grand opening and avoid costly permitting issues. Our experts in code compliance initiated a comprehensive review early in the process to confirm all aspects of the design conformed with the requirements of Chicago’s complex building code. Given the architects on the project were located outside of Chicago, they did not have Burnham’s detailed knowledge of the Chicago Building Code and awareness of the best approach to resolving possible issues. In addition, we wanted to make sure that novel features and intricacies of the design would not hold the project up during plan review. By undertaking a code consulting review very early on, Burnham helped Portillo’s architects identify any potential problems and remedy them before the final application was submitted. One example of the unusual restaurant design was an open egress staircase leading to the second-floor dining room. In most jurisdictions, such a staircase would not be problematic. However, the staircase did not meet Chicago’s strict accessibility requirements for areas of rescue. Burnham brought this issue to the architects’ attention and offered a creative solution: adding an exterior staircase to the design to solve the accessibility issues. We also verified with the Chicago Department of Buildings (DOB) that our recommended plan was acceptable to them. Another potential issue resulted from the Portillo’s model for customer flow through their restaurants. We wanted to make sure Portillo’s customer flow was compliant with Chicago’s occupant load and egress rules. Due to our extensive experience with the city’s requirements, Burnham advised Portillo’s on proper occupant load calculations and identified needed egress routes to make sure the restaurant’s model for serving customers could be used at their new location. Burnham’s unique expertise in code compliance made the preliminary code review so thorough that DOB only had approximately 15 comments on the submitted permit drawings after their review. On average, a new two-story building with a brand-new foundation will usually receive about 40 to 50 comments from the city. In fact, the plans were reviewed and approved so quickly that the General Contractor, Novak Construction, was not even on board yet! 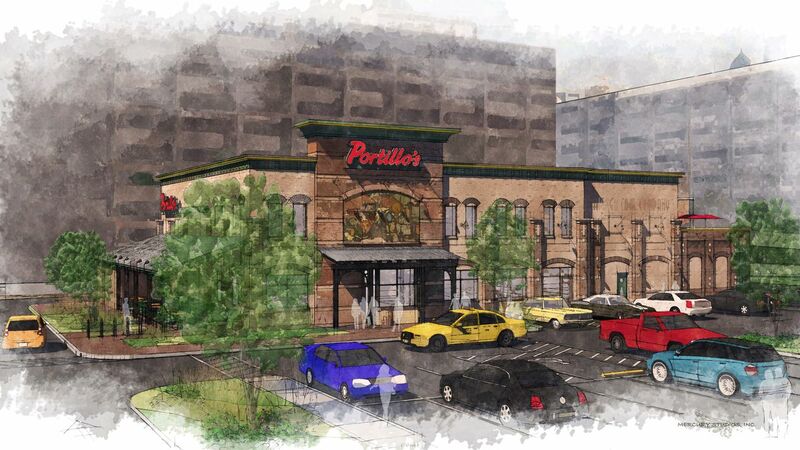 We also facilitated Portillo’s and its team’s ability to work around problems that arose during the project. Portillo’s needed to comply with the City of Chicago’s landscape ordinance that requires developers to include landscaping in their building plans. The project’s landscaping design called for planting trees along the sidewalk in front of the building. When digging to plant the trees during the final stages of construction, Novak Construction realized that there was no soil below the sidewalk and it would be impossible to plant the trees in accordance with the plans. Without the trees planted, Portillo’s would not be able to obtain approval of its landscape plans; and therefore, would not receive their Certificate of Occupancy. This issue was one of the last things standing between Portillo’s and their grand opening. Normally, redoing the landscape design requires reapplying for an entirely new landscape approval and going back to the Department of Zoning and Land Use Planning for a complete review. The department’s initial comments would take four weeks with additional time required for other reviews. Instead, Burnham used our expertise to keep the project on schedule. We were able to leverage our relationships with the city as well as our experience with prior landscaping plans to come up with a creative solution that didn’t require submitting a new permit. Burnham immediately reached out directly to the city landscape reviewer who did the initial plan reviews and let him know that the design was no longer feasible. We presented a revised landscape design which the landscape reviewer quickly accepted rather than making Portillo’s file for a completely new landscape approval. Burnham also contacted the DOB project supervisor, who gave us the ability to upload the new plans without requiring us to file for a new permit. Instead, we were able to add these drawings into the existing permit and obtain approval. Our solution saved Portillo’s valuable time and money. It was a simpler process, more efficient than applying for a new permit, and kept the project on schedule to meet its grand opening date. We at Burnham are proud to be a part of this historic new Portillo’s location, which opened successfully in May 2016.